Special purchases include beautiful porcelain and crystal. Villeroy & Boch's porcelain factory in Luxembourg City closed in 2010 as manufacturing moved to Asia, but the site is still open as an outlet store for ‘seconds’ and end of line items. There is also a regular Villeroy & Boch store in the city centre. Another regional speciality is earthenware pottery from Nospelt, where in August there is a fortnight-long exhibition of local work. The most popular items produced in Nospelt potteries – especially among younger children – are the warbling péckvillchen: glazed and hand-painted terracotta bird-shaped whistles. They are also sold at the Emaischen pottery market, held on Easter Monday in Luxembourg City. For upmarket fashion goods and accessories, Grand Rue in central Luxembourg City has a number of internationally renowned designer label stores. The largest shopping mall in the city is the Auchan Mall on Plateau du Kirchberg, with more than 60 shops selling the full range of goods. Belval Plaza in Esch-sur-Alzette, Luxembourg’s second-largest city, is another very large shopping mall. For advice on where to find what in the capital, Luxembourg City has a dedicated shopping information office, Cityshopping Info Point (www.cityshopping.lu), located just off the central Place d’Armes, open Tue-Sat 1000-1800. Cityshopping also produces a free booklet containing a directory of shops in the city. It is available from the information office or can be downloaded from the website. Shops in Luxembourg City are only open on a few selected Sundays each year, usually those leading up to Christmas. Some other shops do not open on Mondays. Mon 1200-1800, Tues-Sat 0800-1800 (hours vary from shop to shop). Some shops in Luxembourg City and in the larger malls open longer hours. Those in smaller towns and villages may close for an hour or two at lunchtimes. 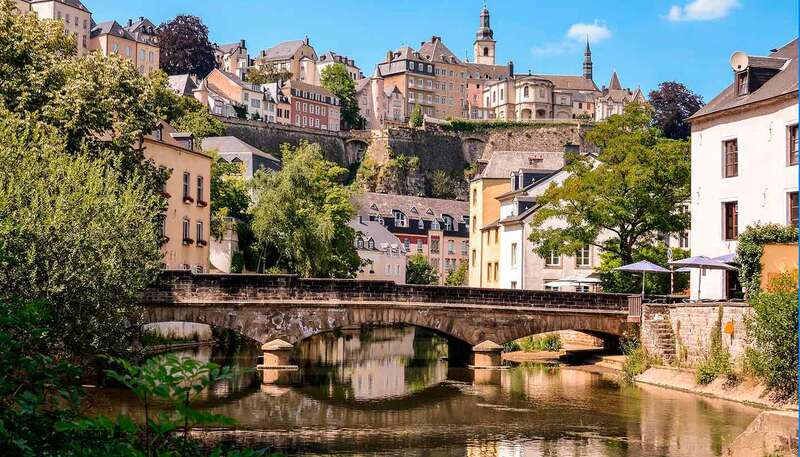 Visitors to Luxembourg City can enjoy a variety of evening entertainment from theatre performances, classical music concerts, opera and ballet, to nightclubs, cinemas and discos. There is also a wide range of top restaurants to suit all tastes. The largest cinema complex in the country is the Utopolis (www.utopolis.lu), an 11-screen multiplex, located beside Auchan Mall on Plateau du Kirchberg. Among younger and more affluent adults, Rives de Clausen has become the focal point of the capital’s nightlife in recent years, since it opened in 2008 on the site of a former brewery in the lower town district of Clausen. There are more than a dozen bars and clubs here that play music into the early hours. There are also several theatres in the city, but few dramatic performances are in English. For more information on all events happening in the city, contact the Luxembourg City Tourist Office. Due to the small size of most other Luxembourg towns and villages, there are fewer theatres, cinemas and nightclubs elsewhere in the country. Esch-sur-Alzette, the second city, has the most options, including the Ciné Belval multiplex cinema, and the Rockhal (www.rockhal.lu), the country’s largest and most important rock music venue. The latter attracts top global acts.